Decorative Life: Years when dried. It is classified in the phylum Bryophyta, which is not a family name. Foamy, gray-green, sponge-like masses 1-4 inches high, the tangled hollow stocks branching and rebranching. 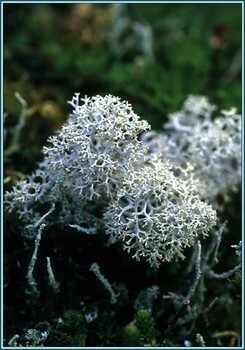 Plant is a fruticose lichen, resembling a miniature tree. A lichen is composed of two separate organisms, an alga (or sometimes a bluegreen bacterium) and a fungus. The alga has chlorophyll and so can manufacture food, and the fungus is made up of spongy threads that support the alga and protect it from drying out. Lichens, especially reindeer moss, are the most important winter food of reindeer and caribou, typically comprising 60 to 70 percent of winter diets. The animals can smell lichens through the snow, and paw down to reach them. Although poor in protein, the abundant carbohydrates in lichens provide energy when caribou need to generate body heat and to fuel their foraging activities in winter.